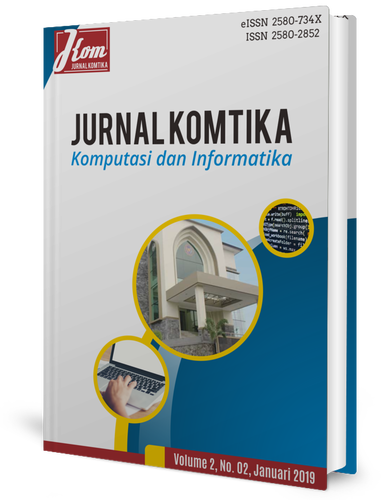 Jurnal Online Universitas Muhammadiyah Magelang (Journal UNIMMA) adalah sistem penerbitan online berbasis Open Journal System yang diterbitkan oleh Universitas Muhammadiyah Magelang. 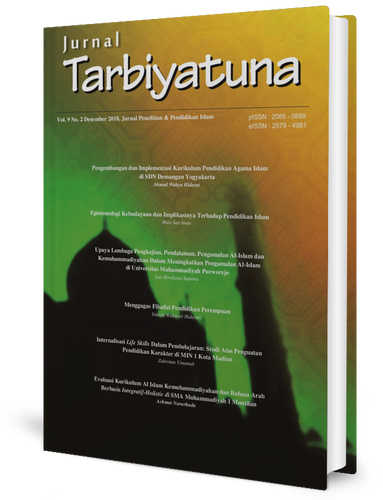 Jurnal Tarbiyatuna contains scientific articles and research results in the field of Islamic education include; Islamic Education Thought, Islamic Education Management, Islamic Education Policy, Issues of Islamic Education, Islamic Education Philosophy, Basic Islamic Education, Islamic Religious Education, and Islamic Education Curriculum. This journal is published twice a year, June and December. Varia Justicia (ISSN 2579-5198) is a peer-reviewed Journal of Legal Studies developed by the Faculty of Law, Universitas Muhammadiyah Magelang. This journal publishes biannually. The scopes of Varia Justicia, but not limited to, are: Constitutional Law, Criminal Law, Civil Law, Islamic Law, Environmental Law, Human Rights, International Law, and also interconnection study with Legal Studies. 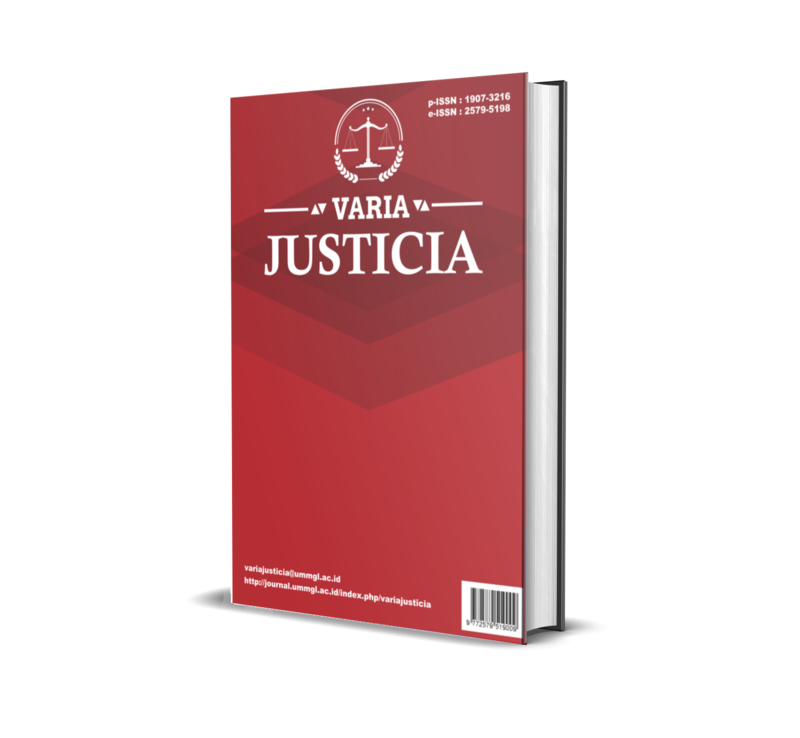 Varia Justicia has been indexed by Google Scholar, Directory of Open Access Journal (DOAJ), Sinta, IPI, Worldcat and others. 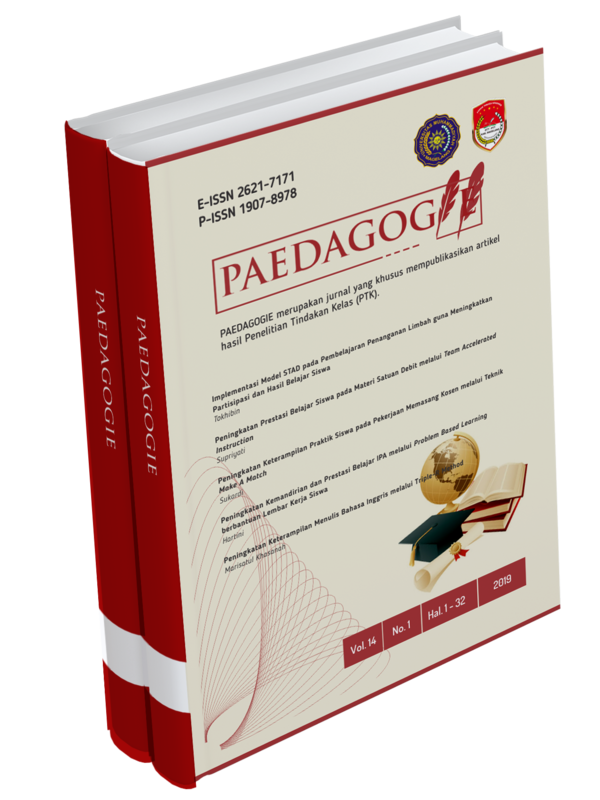 Edukasi is a scientific journal Faculty of Teacher Training and Education Universitas Muhammadiyah Magelang. This Journal serves as a means of dissemination of scientific research results conducted by the academicians both from internal and external. 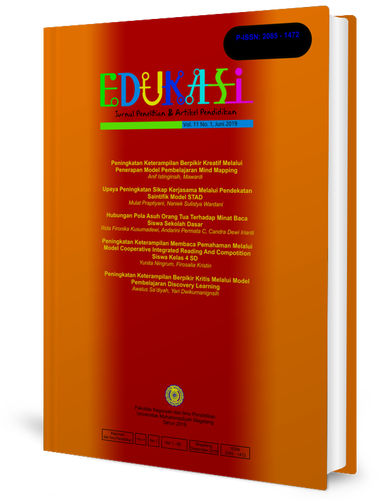 Edukasi contains research results and theoretical studies on educational issues, especially in Indonesia. Nowadays, Edukasi has been indexed in google scholar, sinta, and moraref. 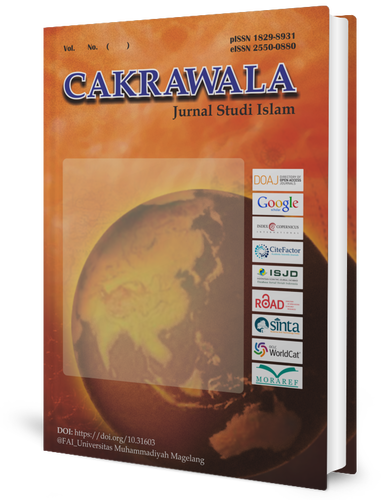 CAKRAWALA is a scientific journal of Islamic studies published by the Faculty of Islamic Studies, Universitas Muhammadiyah Magelang. This journal is issued twice a year and it is a tool for researchers, academics, and practitioners who are interested in the field of Islamic Studies and wished to channel their thoughts and findings, mainly related to Islamic Law and Islamic Economics. The articles contained are the results of research, critical, and comprehensive scientific study which are relevant and current issues covered by the journals. 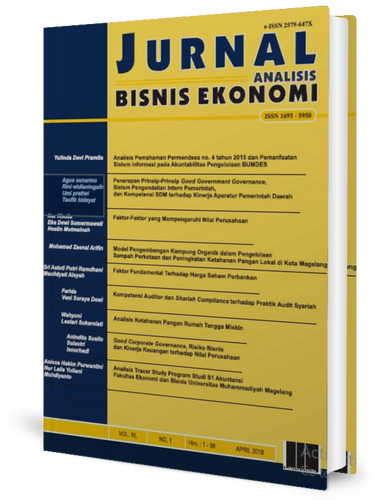 Jurnal Analisis Bisnis Ekonomi is a journal published by the Faculty of Economics and Business, Universitas Muhammadiyah Magelang, published twice a year in April and October. 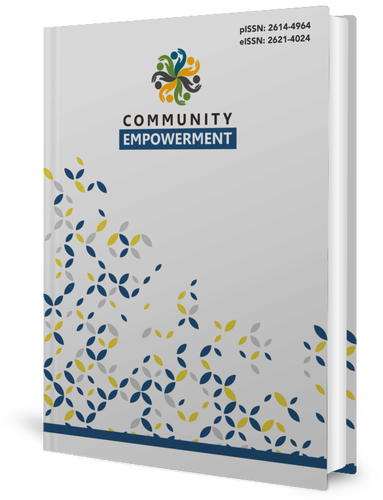 The publication of this journal is intended as a medium of information exchange and scientific work between faculty, alumni, students and the public. The article in this journal contains many articles of research both in business and economics. JHNS is a journal that contains articles in the field of nursing, which includes several specializations such as: Medical-Surgical Nursing, Emergency Nursing, Child Nursing, Maternity Nursing, Mental Nursing, Community Nursing and Nursing Management, at all age levels and health care order. 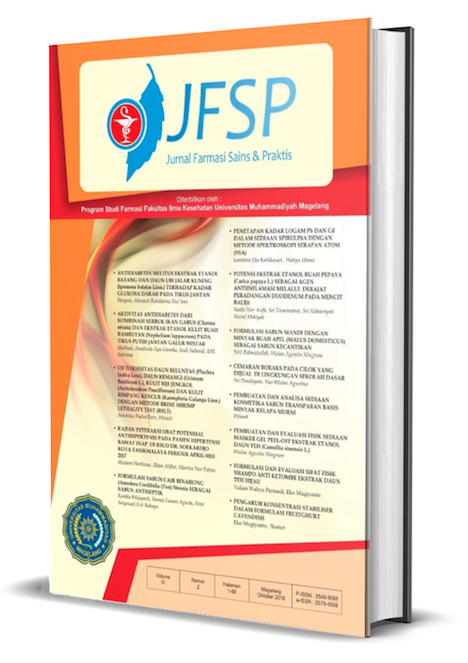 Jurnal Farmasi Sains dan Praktis is a scientific journal published by the University Muhammadiyah Magelang. Jurnal Farmasi Sains dan Praktis published two times a year, namely in April and October since 2014 with p-ISSN 2549-9068 and e-ISSN 2579-4558, open access, peer-reviewed. The article published in the Jurnal Farmasi Sains dan Praktis should not be published in other journals or have been previously published. Jurnal Farmasi Sains dan Praktis aims to serve the updated scientific knowledge for international researchers in pharmaceutical sciences. Jurnal Farmasi Sains dan Praktis accepts review articles, original research articles. 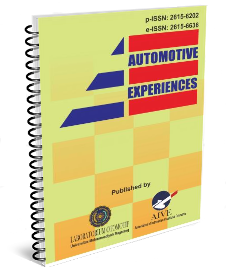 Automotive Experiences is a peer-reviewed journal publishing high-quality articles both in English and Bahasa Indonesia in the field of automotive technology. Automotive Experiences is managed by Automotive Laboratory of Universitas Muhammadiyah Magelang in collaboration with Association of Indonesian Vocational Educators (AIVE). This is a scientific journal specifically address findings, engineering, and automotive experiences that prepared for indexed in a major database. We invite lecturers, students, automotive practitioners, and industry researchers to publish their research in Automotive Experiences. PAEDAGOGIE merupakan jurnal yang khusus mempublikasikan artikel hasil Penelitian Tindakan Kelas (PTK). Peraturan Menteri No. 44 Tahun 2015 mengamanahkan kepada perguruan tinggi dalam hal penelitian dan pengabdian kepada masyarakat [PkM]. Penelitian dan pengabdian kepada masyarakat (PkM) menghasilkan kreasi dan inovasi yang diharapkan tidak hanya berhenti pada hasil penelitian, akan tetapi sampai ke tahap publikasi dan komersialisasi. Penelitian dan PkM merupakan upaya perwujudan explorisasi diri. Proses ini dapat meningkatkan kualitas diri peneliti, hasil temuan peneliti juga membawa manfaat bagi masyarakat. Tentunya hasil penelitian yang ada memerlukan forum untuk diseminasi, diskusi luaran, komunikasi dan temuan penelitian.